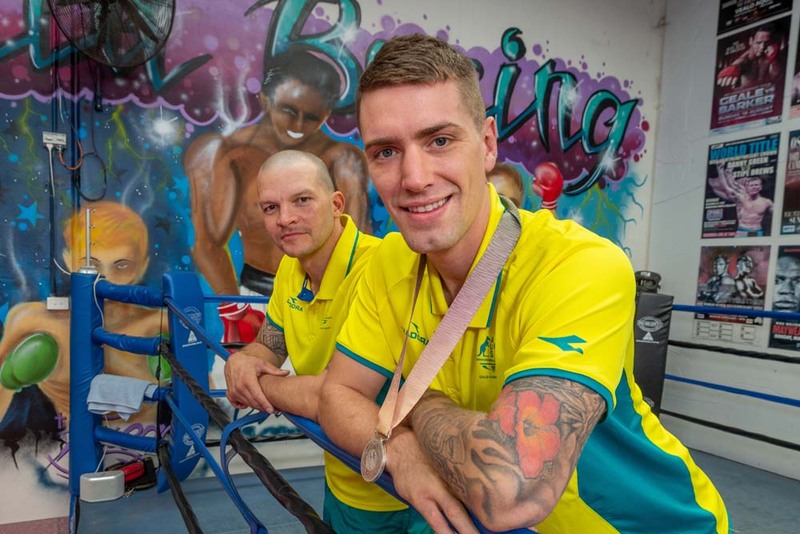 PENINSULA boxer Jason Whateley has fallen just shy of his dream gold medal at the Commonwealth Games on Saturday 14 April after being defeated by none-other than the 2014 Commonwealth Games gold medallist, David Nyika. After three attempts at qualifying for the Games, Whateley finally broke through earlier this year and cemented his spot in the 13-strong Australian boxing squad which headed to the Gold Coast for this year’s Commonwealth Games. Whateley entered the international competition with one goal in mind, a gold medal in the heavyweight division (91kg), and it took the world’s seventh best heavyweight boxer, David Nyika, to stop him in the final. After dismantling Northern Ireland in the quarter-finals and then India in the semi-finals, Whateley faced the 22-year-old New Zealander in the main event and went down by a unanimous 3-0 decision. Whateley claimed a silver medal and said that while he was a bit disappointed on missing out on gold, it was still a dream come true for him to fight in front of the Australian crowd. “It’s a weird situation to be in,” he said. “If someone told you several years ago that you’d be competing for a gold medal at the Commonwealth Games, you wouldn’t believe them. The Commonwealth Games had always been the main target for Whateley after an intense 13-fight year and he made sure he took everything into account when competing against some of the world’s best boxers. “We had a plan and we just had to go through the motions,” he said when talking about his gold medal fight. Peninsula Boxing head coach Marcos Amado was there every step of the way with Whateley, and after a year and a half of working together, Amado said he couldn’t be prouder of how Whateley handled himself in the ring. Last Monday, Whateley and fellow Australian boxer, and 2018 Commonwealth Games gold medallist Harry Garside, went down to Peninsula Boxing for a 45-minute meet-and-greet with the junior boxers and put on show their rewards for representing the country. But after a year which accumulated a Commonwealth Games silver medal, two Australian titles, a Victorian title, an Australasian Golden Gloves gold medal and a top eight finish in the World Championships, Whateley said he had gained a lot of experience and is ready to take a “bit of time off now”. “I’ll be back around June to late-May and until then I’ll just be doing little bits and pieces,” he said. That “new chapter” was announced on Sunday 6 May as joining the professional ranks after racking up 98 fights in his amateur career. A time and date is yet to be announced on when he will make the transition but he said he will make sure he’ll “never die wondering”.